Employers who wish to mitigate the risk of a negligent hire and protect their company from unnecessary liability for non-compliance understand the importance of professional background screening with Choice Screening. We want to make it easier for you to improve your background screening knowledge. 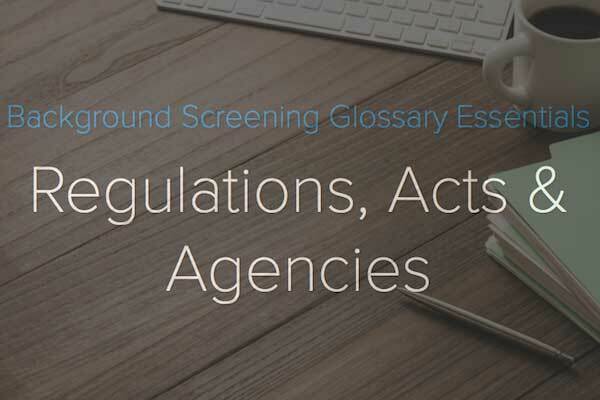 The below terms, focused on regulations, recent legislation and acts, and agencies associated with the background screening industry, are your jumping off point to compliant background screening. Compliance – In background screening, to act in accordance with all regulatory agencies and federal, state and local laws regarding the procurement and use of a background report. Department of Homeland Security (DHS) – A Federal agency that, along with Social Security Administration, returns E-Verify results for employment eligibility verifications. EU-US Privacy Shield – The framework for personal data transmission between EU Member States/Switzerland and the US. Formally adopted on July 12, 2016, as a replacement for Safe Harbor. File – Per the FCRA, all the information on a consumer that is retained by the CRA regardless of how the information is stored. Office of Inspector General (OIG) – A division of the Department of Health & Human Services (HHS) charged with protecting the integrity of the Department and the health and welfare of program beneficiaries. Safe Harbor – An agreement between EU Member States and the US to enable transfer of personal data for the purposes of background screening. Safe Harbor was eliminated by the EU effective immediately on October 6, 2015, after being active for 15 years. Social Security Administration (SSA) – A Federal agency that, along with Department of Homeland Security (DHS), returns E-Verify results for employment eligibility verifications. At Choice, it’s important that we show our client commitment by making the information you need readily available. With over 10 year’s experience, we’ve learned a thing or two about background screening!